December 23, 2009 December 23, 2009 Warners' Stellian Appliance3 Comments on Why do front-load washers take so long? Many customers seem confused when we explain that front-load washing machines need an hour minimum for a normal wash cycle. Luckily, for times when I can't wait an hour and a half for a clean outfit (sports uniforms, anyone? 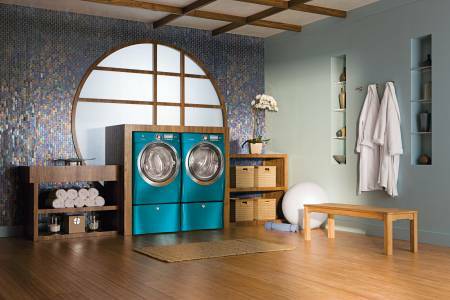 ), I have the 18-minute wash, 18-minute dry feature from Electrolux (though my laundry room looks nothing like this). In a word: lifesaver. But front-load laundry machines profess great water and energy savings. How does a longer cycle reconcile with such efficiency? First, front-load washers don’t fill deeply with water, only to dump it all out a short while later. Rather, they pump in a minimal amount of water (some models use sensors to determine the size of the load). Water continuously filters in and out throughout the cycle, meaning the water stays clean the entire time. Top-load washers fill with water until the clothes float, and then the clothes just sit in that water for the entire cycle. Also, heating the water often takes longer in a front-loader. A sanitation wash cycle takes about two hours. But you can be assured the hotter temperature eliminates all the cold and flu germs and dust mites congregating in your clothing and linens. The good news is laundry still takes the same amount of time because dry times have been cut in half. We used to wait for the hour-long drying cycle to finish long after the washer was done. But now, because front-load washers extract so much water during the spin cycle, the average dryer cycle lasts only about 30 minutes. Or for me, the skinny jeans (which I refuse to put in the dryer because they may get a bit too skinny) I hang on a drying rack easily dry by morning. Could it just be your brand of front load washer? Generally, front load washers does a quicker job in doing laundry. But if you experience otherwise, this might be due to larger laundry loads. Since it has bigger drum capacity, you have more space for laundry. It might work longer than top loaders but it cuts down your laundry loads. I’m not sure that front-loaders generally do a quicker job, but they definitely do handle larger loads — which result in an overall shorter laundry time, you’re right.